The recent EU-NATO meeting at the NATO headquarters on the December 8 regarding cooperation in tackling emerging security challenges and the establishment of the Permanent Structured Cooperation (PESCO) are two of the many developments which demonstrate that we are at a historical juncture in terms of the transatlantic relations and what they signify for NATO and the EU. The architecture of the global security environment has undergone drastic modifications due to various factors that come into play. On the one hand, the U.S. and Europe are facing a wave of illiberal movements, on the other hand Russia is amplifying its revisionist stance and the Islamic State is becoming ever-more threatening. Under these circumstances, seeing the transatlantic alliance weaken could not be solely classified under the realm of the impossible. In order to avoid such a doomsday scenario, the interweaving of NATO capabilities with EU competences in such a manner that only the best from each is put forward in future defense strategies is what should be on the agendas of all future EU and NATO high-level meetings. in which the economic power of the US – which translates into American military power – is slowly declining which makes the distance between the US and its Allies relatively shorter in terms of diplomatic, economic, military, technological and cultural matters. in which the new PESCO agreement is seen as NATO’s main competitor, bringing about a clash of strategic geopolitical interests. For these reasons, the two security actors can work together in partnership, while bringing to the table the best they have to offer. Reaching a level where the capabilities of both NATO and the EU are more or less on the same playing field requires a stronger NATO-EU partnership. NATO’s high-end military capabilities and extensive transatlantic reach are two of the definitory traits of NATO’s defense system. In terms of its military capabilities, NATO owns its very own fleet of Airborne Warning and Control (AWC) surveillance aircraft and is currently developing Global Hawk surveillance drones. This comes as an addition to the equipment and troops that individual Allies normally commit to NATO. Going beyond the field of defense using traditional military capabilities, NATO is called upon to respond to a whole range of missions and functions in the non-traditional sense. At one side of the spectrum, we would benefit from NATO’s high-end military capabilities and extensive transatlantic reach. However,while most military strategic priorities before 2014 were targeted on ‘crisis intervention, nation building or expeditionary operations, today’s priorities are clearly directed towards territorial defence and deterrence’. What we are in fact noticing is that crisis management through military intervention is not as likely to happen as before. What this means for NATO is that out of the three core functions from the 2010 Strategic Concept, namely crisis management, partnership and self-defence, the latter is the one which should take center-stage either with NATO putting more emphasis on it or with the EU filling this gap. The EU – as a non-military security policy actor – can bring to the table a broad array of proficiencies to complement NATO’s. To begin with, its far-reaching small-operations civilian and military expertise is one clear example. In terms of the military capabilities of the EU, we are solely referring to crisis management by intervention and not to self-defence (which has traditionally been NATO’s task). Needless to say, if military crisis management becomes less likely to work (especially in the context of emerging security threats), EU’s military capabilities have the potential of carrying less weight. In order to avoid this loss of EU defense resources, NATO could take these EU capabilities under its protective wing in order to use them in complementary ways, alongside NATO’s hard security. It is just as important to highlight that apart from the shortcomings of EU crisis management by intervention, another EU weakness lies in the fact that the block is currently not in the best shape of its 60-year old existence as a cause of different goals pursued by different EU nations, on top of the pressure of a financial crisis, which makes it unlikely that EU members will be on the same page regarding security and defence issues. How Can the NATO – EU Partnership Play Out? In order to better understand how the NATO-EU alliance can work in terms of security and defense, let us consider the case of Portugal through a historical perspective. Portugal is one of the many countries which has benefited from both a comprehensive NATO defense apparatus and a EU one. Historically, NATO is seen as the organisation which has taken on board the larger military, such as the intervention in Afghanistan. This is due to the fact that NATO is in possession of all of the required resources needed to showcase ‘hard power’. Contrastingly, the EU security interventions in which Portugal had engaged in were mostly using ‘soft power’, while being also relatively much smaller in scale. While the EU is playing a major role up to this day, NATO is still perceived as the main defence actor that is able to intervene in crises of all magnitudes. The EU, on the other hand, is still much more deficient in that ‘accumulated know-how that NATO possesses’. It is important to note that for European nations of small and medium sizes, such as Portugal, maintaining a strong presence in NATO is extremely important. Therefore, the act of balancing the commitment to enhance EU’s security and defence capacities with the continued support for NATO enlargement and its military operations gives states such as Portugal ‘the advantage of not putting all their eggs in one basket’. In order to properly address terrorism, migrant flows, state collapse and overall instability coming from the Global South, NATO must discover a way to complement EU security efforts especially in view to crises that need to be addressed using the full spectrum of policy tools. A historical example is represented by a mechanism named Berlin-Plus which exists to lend part of NATO’s integrated command structure to the EU. Nevertheless, Berlin-Plus and other NATO-EU arrangements are currently frozen political matters because of disputes among EU and NATO members regarding the Cyprus question. Bearing in mind the gravity of this situation, NATO should consider alternatives. For example, complementing the efforts of coalitions involving NATO and non-NATO states is a good way to go around the Cyprus situation and fully implement Berlin Plus. There is a host of pessimistic voices proclaiming that the EU-US transatlantic cooperation is likely to cease. 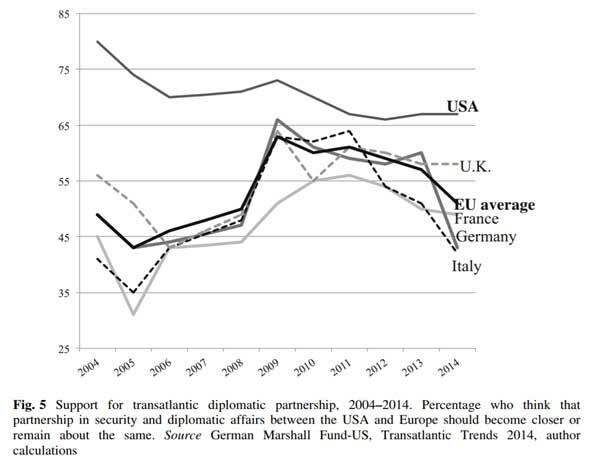 One of the first arguments they use is the declining public support for the cooperation between the two actors on matters of defense and security which has seen a sharp decrease since 2008 (see the chart to the right). Another set of negative views on the EU-US transatlantic cooperation comes from the current President of the United States himself who has stated at various points both on the campaign trail and once taking up office that the European allies are free riding on American capabilities and are not fulfilling the 2% pledge. However, it is noteworthy to mention that this pledge is wrong-headed because of the fact that it is a politically-constructed benchmark which makes it merely a tool used by the Trump administration for naming and shaming. All things considered, the bottom line is that the weaker the transatlantic partnership becomes, the less safe and prosperous people across both sides of the ocean will feel. Therefore, it is in the interest of all parties to maintain the alliance and work towards strengthening it by intertwining the defense and security instruments of both NATO and the EU and complementing each other’s capabilities in order to deter and counteract the aggressive actions of opposing camps. While NATO is the superior transatlantic alliance in the defense and security arenas, it might not take the same leadership roles it is accustomed to in other areas and might have to work within a wider network of institutions, such as the European Union. This challenging of traditional roles is something that should be expected and embraced since it would be serving the higher purpose of making the world a safer place in an increasingly unpredictable security environment. *Alina Toporas is a recent Master of Science graduate in Global Crime, Justice and Security at the University of Edinburgh Law School. She has previously worked for the European Commission Representation in Scotland, the International Anti-Corruption Academy (IACA), the Romanian Embassy in Croatia and Hagar International (the Vietnamese branch), an international NGO that deals with the reintegration of victims of human trafficking. Alina Toporas is the winner of various international essay and article competitions on security themes, such as the one organised annually by the University of Houston in partnership with the Brookings Institute on the ‘use of military means as solution to today’s international and national political issues’. She is currently an active EuroPeer in the United Kingdom, working on spreading information on youth opportunities in the EU and creating an alternative for the Erasmus+ programme post-Brexit.